This is one of the easiest of the tropical silkmoths to breed in captivity, feeding readily on rhododendron. Foodplant should always be fresh (this requires keeping it in water and changing at the very least every other day). 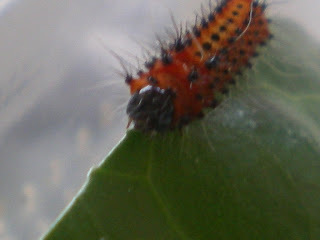 It s best to keep the caterpillars well ventilated to prevent moulding of the faeces and disease. These images are of the caterpillars and a freshly emerged adult male. For some reason I do not have photographs of the other stages, but I will take photos as they happen and post them on this blog. Update: While going through some unsorted material in my collection I found a couple of cocoons and pupae. These were both spun around some loose sheets of newspaper placed in the cage - which is easier to handle and prevent from moulding than cut foodplants. After one of the moths hatched I cut open the cocoon so the pupa could be viewed.